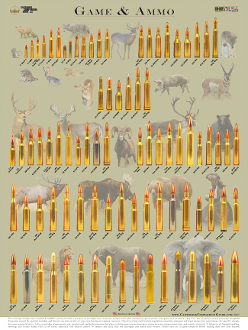 The Game & Ammo © poster (built specifically for youth, beginning hunters, & other enthusiasts) opens the reader’s view to the range and breadth of game animals that can be hunted on the world stage, while providing a strong sampling of proven cartridges for hunting these animals. This poster is an exciting and very beneficial visual aid for anyone who reads it. The context, proximity and overall arrangement encourage good and informed discussions. In fact, this poster was developed in cooperation with Hunter Education instructors to develop a superior teaching tool. Poster dimension: 18x24 inches. Images are full color on High gloss / High quality 100lb poster paper.